They can found by clicking the thumbnail to the left or the links below. More are coming shorty. 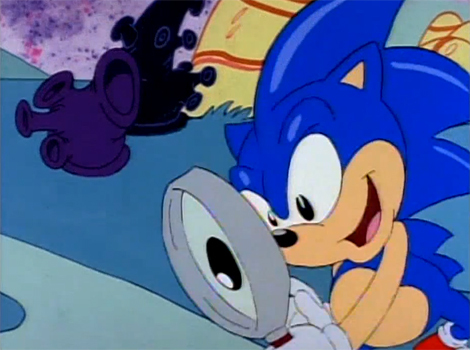 THE WHITE PART OF HIS 'EYES' IS REALLY FUR, AT LEAST IN AoStH LAND. If you remember this old relic, I've now incorporated it into the search results. The SHQ Encyclopedia isn't nearly as good as some of the other stuff out there on the net but it still has some worthy content. I haven't decided if it should get its very own portal yet as it is still very much beta. You will now notice a search bar near the top of the page. 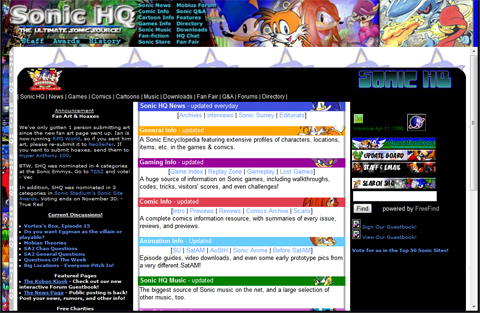 You can now currently search through music, games, comics and articles that were posted here. Please note that it is a work in progress but still very functional. What's this? A links section? It is! 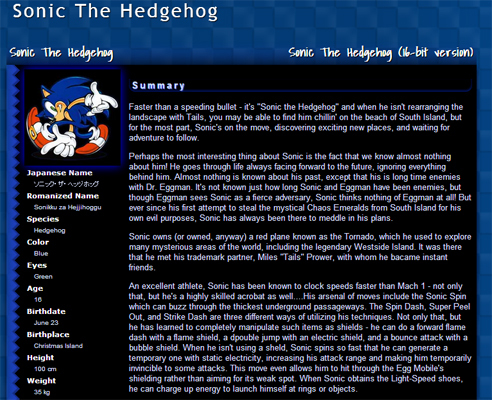 It is also very much incomplete but if you know of any Sonic sites that aren't already on there, you're more than welcome to submit a link. In the new directory you'll find both current sites and old. 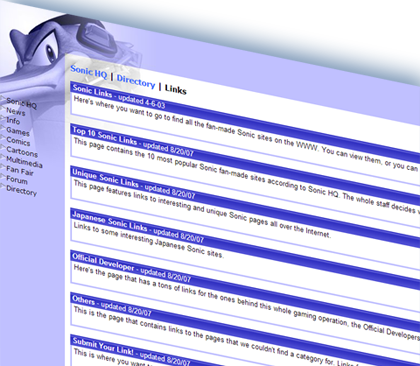 Sites that were listed on the old directory have migrated over that are still up and running. Sites that are not active anymore have been put in their own category. I edited a thing, then this happened. Lighty told me to post this cute comic that follows the original genesis games zone by zone. Hasn't updated in a long while and probably won't update anymore period. Oh well. Want to read the full issue? You can get it here! 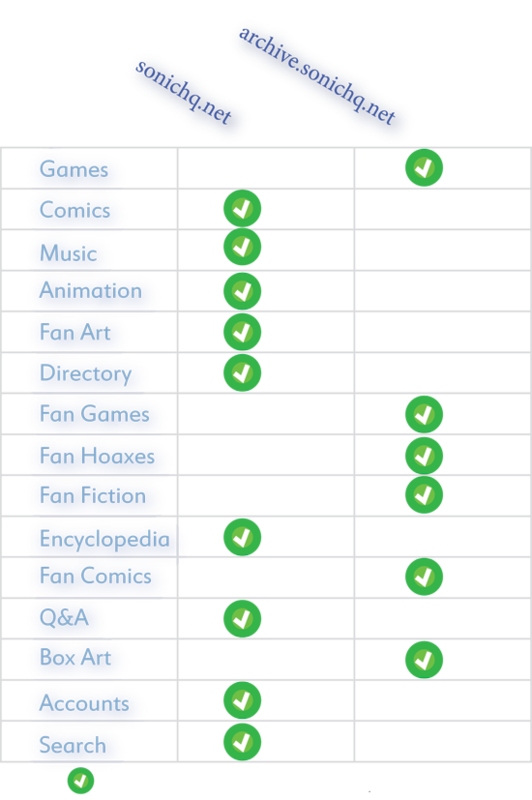 This is a comparison chart of the main differences between this and the older version of the site at archive.sonichq.net/newsite Green boxes denote that the user experience will likely be better while red boxes mean user experience will be weaker. Ã˜ means that it is missing. Even still, the Archive site is still a vital portion to this site. Note that a lot of the sections won't make an appearance on the new SHQ mainly because other sites just do them much better and our content isn't stellar to begin with. Like Fan Fiction. I figured it was time for a new, fresh look. The other theme will also get tweaked and I do hope to still add more in the near future. We're looking for comic reviewers! Anyone can take part in this. All you need is a SHQ account which can be registered here. 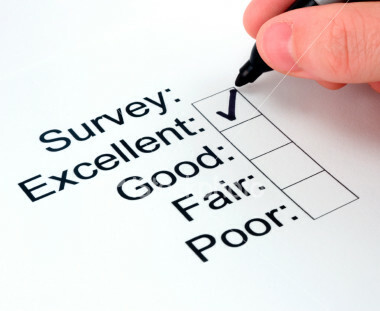 A link for posting reviews will appear on the side when logged in. Current reviews can be found here. 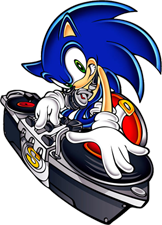 Sonic 1, 2, 3 (and Knuckles) and Sonic CD have been added to the music section! You can find it here. It contains all tracks from SA, SA2, Sonic Heroes, Sonic 2006, Sonic Unleashed, Sonic Colors and Sonic Generations. More is definitely coming! You can search out individual tracks or even search by artist. Music is streamed through your browser. It even works on smartphones. No flash required. I'm happy to say that the Comics Section has been redone with more HTML5 in mind. I hope this will improve the user experience! You can scroll through using your mouse wheel, the mouse itself and even the arrow keys on the keyboard. Note there are still some comics are missing from the database and comics are still being added. We're testing a new experimental feature by offering the preview pages officially released in a HTML5 format that modern browsers can take advantage of. Remember the old Sonic HQ? I mean the really old SHQ. Sonic HQ of years past. Chances are you haven't seen it in a while! Special thanks to Andy for all the files! Well it used to be called the music section but it's really 90% midis. You remember those, right? The thing that was popular on the web before mp3s took off and would play in the background with no option to turn off. Well we have some. Don't worry, they don't play in the background. You can check them out here. Strange equine creature trapped in colorful rectangular room with no way out! Probably wants some hugs. Rescue workers are running to find strategy guides to assess the situation. I've added a Games link to the menu. It's still very much a work in progress! 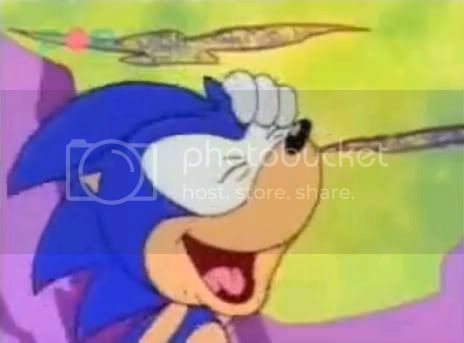 Additionally, you can find a new subsection in the Animation section dubbed as "Sonic HD" containing HD Sonic content, some fan made, some official. Oh yeah, also testing a new layout. I've been wondering this for quite a while, but what happened to the pictures in the game index to the archive. Like several years back they just vanished. What happened? There is a slight language warning, other than that watch watch watch. 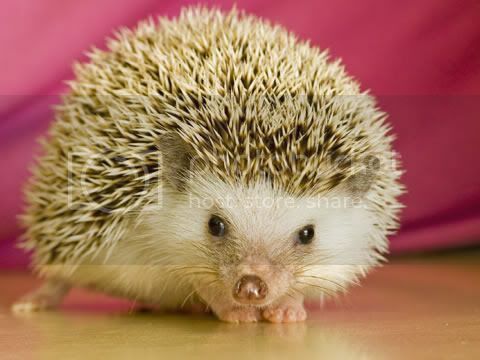 You can check it out here: Sonic Merchandise. It's just Europe for now but they say an American release will be soon to follow. It's becoming more and more obvious Tails will be playable in Sega's next installment to Sonic 4 but remains to be known is the scope of his play-ability. Will it be optional a la Sonic CD Rerelease/Sonic 2/S3&K?. I'm betting on optional. Sega has learned its lesson.